Advertising revenue is getting harder to come by for publishers, and The New YorkTimes is no exception. Its advertising revenue fell 7% in the first quarter, with an 18% drop in print ad revenue. But there are other options. This week, the NYT announced it is relaunching NYT Cooking as a paid product, as well as revamping its online store to make revenue from subscriptions and merchandise. NYT Cooking was formed in 2014 as part of NYT Beta, the company's product development group. Beta has also launched Watching, the publisher’s TV and movie guide, as well as Real Estate, Well, Smarter Livingand Crosswords. 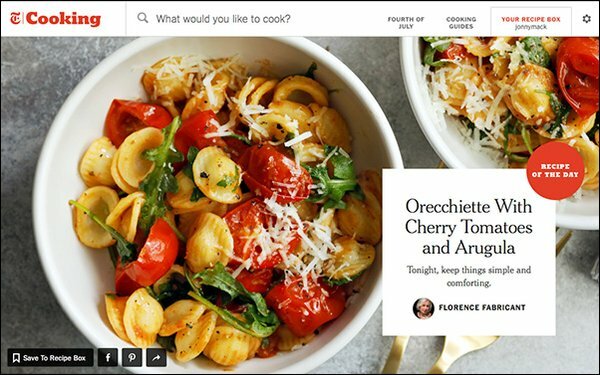 The newspaperwill now charge users $5 a month to access the entire trove of 18,000 recipes on NYT Cooking. Subscribers will also get to use its recipe box tool, which allows users to save recipes from around the web, as well as rate and leave notes on recipes. Users that have registered accounts on NYT Cooking but do not pay for a subscription will have access to a limited selection of editor-curated recipes, collections and guides for free. They will be updated regularly with seasonal recipes, new content and recommendations from Cooking editors. Cooking has 10 million monthly unique users. “When we launched Cooking way back, there was talk of it becoming a subscription product right away. But instead, we decided it was more important for us to grow our audience and prove there was market demand for Cooking — before we decided to create a subscription product,” NYT Cooking product director Amanda Rottier told Nieman Lab. The NYT has more than 2 million digital subscribers. It is pushing to add more as it strives to achieve its goal of generating $800 million in digital revs by 2020. Last year, the NYT partnered with meal delivery service Chef’d to send users meal kits based on its recipes. The publisher has also relaunched its online store with an updated inventory and new design and logo. It is an effort to emphasize the newspaper's brand and offer merchandise to engage its readership. The new design runs on the ecommerce platform Shopify Plus. The online store features Times-branded and inspired merchandise, books, photographs and other items. Products include framed reprints of over 57,500 Times front pages, travel guides and branded tote bags and sweaters.